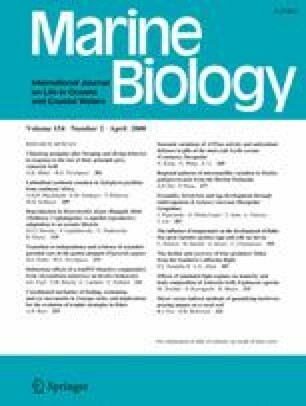 The known negative effects of shellfish toxin-producing dinoflagellates on feeding, burrowing and survival of some bivalve mollusks has prompted questions concerning whether they might also impair the internal defense system of affected bivalves and make them more susceptible to disease agents. The primary components of the cellular defense system are hemocytes. Many toxic dinoflagellates are too large to be ingested whole by hemocytes and would most likely be exposed to intracellular toxins only after the algae are consumed, broken down, and the water-soluble toxins, released. Therefore, we conducted a series of experiments in which hemocytes from two suspension-feeding bivalves—the Manila clam, Ruditapes philippinarum, and the softshell clam, Mya arenaria—were exposed in vitro to filtered extracts of one highly toxic paralytic shellfish toxin (PST)-producing and one nonPST-producing strain of Alexandrium tamarense (isolates PR18b, 76 ± 6 STXeq cell−1 and CCMP115, with undetectable PST, respectively). We measured adherence and phagocytosis, two hemocyte attributes known to be inhibited by bacterial pathogens and other stressors. We found no measurable effect of a cell-free extract from a highly concentrated suspension of the PST-producing strain on hemocytes of either bivalve species. Instead, extract from the nonPST-producing strain had a consistent negative effect on both clams, resulting in significantly lower adherence and phagocytosis compared to strain PR18b and filtered seawater controls. The bioactive compound produced by strain CCMP115, which has yet to be characterized, may be similar to the PST-independent allelopathic compounds described for Alexandrium spp., which act on other plankters. These compounds and those produced by other harmful algae are known to cause immobilization, cellular deformation and lysis of co-occurring target organisms. Thus, nonPST producing Alexandrium spp., which do not cause paralysis and burrowing incapacitation of clams, may still produce a compound(s) that has negative effects not only on hemocytes, but on other molluscan cell types and their functions, as well. This study was conducted with support from the French Centre Nationale de la Recherche Scientifique (CNRS) to VMB and from the US NOAA-Ecology and Oceanography (ECOHAB) Program (Grant #NA06NOS4780247) and is ECOHAB publication no. 257. We are grateful to Annaïck Barbou, Marcel Koken, Alain Le Mercier, and Alain Marhic at IUEM for their generous help throughout the project; Stephane Pouvreau (IFREMER, Station d’Argenton) and Michel Le Duff (IUEM) for their help in locating, and sampling, the Aber Benoit M. arenaria population, respectively; and the “Host–Pathogens Interactions” group at IUEM who helped in digging clams. We thank Laurie Connell, School of Marine Sciences, University of Maine at Orono for gene sequencing of Mya arenaria specimens used in this study, Michael Quilliam, IMB/NRC, for spirolide analysis of the two A. tamarense strains used, and Scott MacQuarrie, IMB/NRC, for his technical assistance. Contribution no. 1073 of IUEM and publication no. 2008-4772 from IMB/NRC.